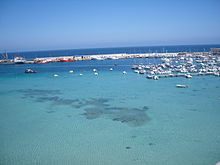 Since ancient times the Strait of Otranto was of vital strategic importance. The Romans used it to transport their troops eastwards. The legions marched to Brundisium (now Brindisi), had only a one-day sea voyage to modern Albania territory and then could move eastwards following Via Egnatia. During World War I, the strait was of strategic significance. The Allied navies of Italy, France, and Great Britain, by blockading the strait, mostly with light naval forces and lightly armed fishing vessels known as ‘drifters', hindered the cautious Austro-Hungarian Navy from freely entering the Mediterranean Sea, and effectively kept them out of the naval theatre of war. The blockade was known as the ‘Otranto Barrage’. In 1992, Albania and Italy signed a treaty that delimited the continental shelf boundary between the two countries in the strait. In 1997 and 2004, nearly 100 people lost their lives trying to illegally cross the strait following the 1997 unrest in Albania and poor economic conditions in the Tragedy of Otranto and the Karaburun tragedy. In 2006, the Albanian government imposed a moratorium on motor-powered sailing boats on all lakes, rivers, and seas of Albania to curb organized crime. The only exemption to the rule are government owned boats, foreign owned boats, fishing boats, and jet boats. In 2010, the moratorium was extended for 3 more years, until 2013. Wikimedia Commons has media related to Strait of Otranto. ^ Frank K. McKinney (2007). 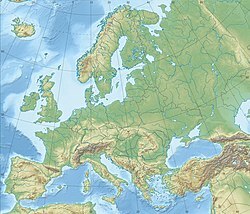 The Northern Adriatic Ecosystem: Deep Time in a Shallow Sea. Columbia University Press. p. 29. ISBN 978-0-231-13242-8. Retrieved 6 March 2013. ^ "Archived copy". Archived from the original on 2011-07-06. Retrieved 2011-02-25. CS1 maint: Archived copy as title (link) Council of Ministers of the Republic of Albania, www.keshilliministrave.al, 10 August 2006. This article about a specific location in Vlorë County, Albania, is a stub. You can help Wikipedia by expanding it. This page was last edited on 24 February 2019, at 22:24 (UTC).